The Hinkley Plantation large designer 10 light pineapple chandelier with shades, finished in pearl bronze, a quality designer light with with stunning classic features, supplied by Elstead Lighting and designed by Hinkley. 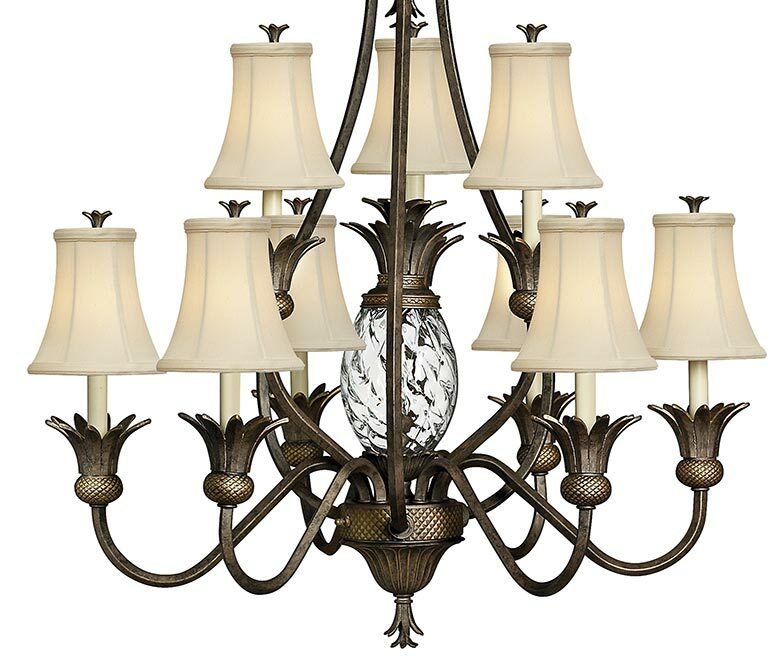 A Hinkley classic, this ornate Plantation light collection features exceptional pineapple shaped clear optic glass that makes a noble statement. 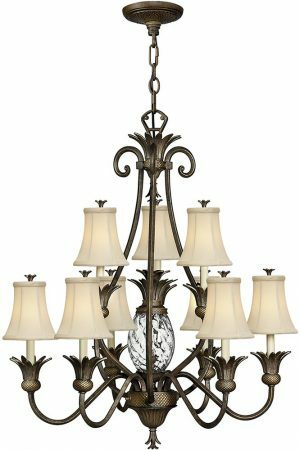 The pearl bronze finish has matching candle sleeves and elaborate decorative cast detailing. Immense detail has been captured within this chandelier from the cast detail on the ceiling rose through to the curved rosette plumes on the cut glass body and the lower finial. The clear cut globe houses a lamp that will catch the light causing it to be cast at different angles with a crisp sparkle as it reflects. Each of the ten off white shades are held in place, again with rosette finials. Finished in a pearl bronze, this stunning large feature chandelier will look fantastic in a period lounge, dining room or entrance hallway creating the traditional welcoming theme for which the pineapple has become known. This ceiling light is a tall fitting and will require plenty of ceiling height to accommodate. Supplied with 305cm of chain that can be shortened at the time of installation to suit your ceiling height, please see the technical information below for dimensions. An absolutely remarkable feature lighting range incorporating the pineapple in its design. There are so many exotic fruits to choose, yet the pineapple has for centuries appeared in numerous traditional lighting styles and in all honesty looks aesthetically in place. This elaborate and elegant light is designed in the USA by Hinkley Lighting, founded in 1922 in Cleveland, Ohio. They have transformed from a small outdoor lantern company to a global brand intent on bringing you the best in style, quality and value, such as the Hinkley Plantation light you see here. Their long heritage combines with a pursuit of innovative design to create modern and contemporary lighting to illuminate what you treasure most.